It is not well known that Alberta is Canada’s largest coal producer. Alberta’s current coal reserves represent nearly twice the energy of all other non-renewable energy resources in Alberta, including natural gas, conventional oil, and the oilsands. While there have been over 1,800 coal mining operations in Alberta through the last two centuries, only 12 active coal mines remain. Although none of them involve underground work, the evidence of underground coal mining and the men and families whose lives depended on it still exists in the hundreds of fascinating historical remnants of an era now long past. In 1786, reports of coal floating in the North Saskatchewan River reached Fort Edmonton; in 1798, a boatload of blacksmithing coal collected from the river’s sand bars arrived in Edmonton. During his fabled trek along the foothills of the Rockies in 1792, Peter Fidler made significant notes in his journals of rich coal-bearing strata along the East Slope. Euro Canadian settlement was slow to follow, but by the 1870s, ranchers, Métis freighters, and a handful of farmers needing to warm their shelters and cook their meals were digging coal from the readily available seams along the streams, creeks, and coulees of the southern plains. The subsequent years were filled with the efforts of coal mining pioneers from Nicholas Sheran and the Healy brothers to Alexander and Elliot Galt. Building on the mining successes of Sheran in particular, the Galts launched their North-West Coal and Navigation Company in December 1882, and Alberta’s coal mining boom was underway. 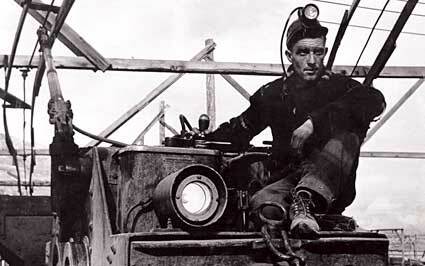 Mines were soon operating across the province, as other adventurous entrepreneurs took the plunge to invest their life savings into the world of mines, markets, collieries, unions and company towns. Not one, but two coal mining towns emerged along the Cascade River in the newly minted Rocky Mountains Park (Banff). This was hardly surprising, given that the coal burning Canadian Pacific Railway was the reason the park existed in the first place. The mines at Anthracite (1896) and then Bankhead (1904) provided domestic and railway coal for more than thirty-five years before the 1920s’ conservation movement ended mining in the park. But what is all of this to us? It is in fact a beautiful glimpse into our own past, a time when industry, work, and community were inextricably linked. It was a different time, an era now gone, but hardly forgotten. 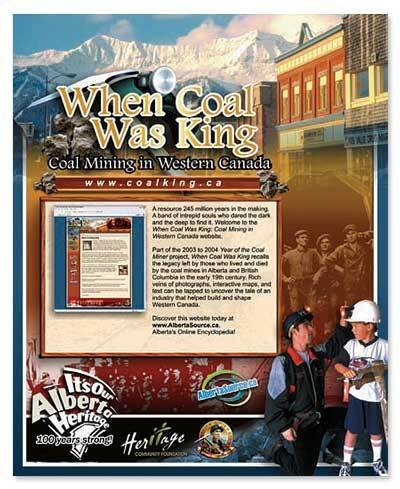 The sense of their common history has caused numerous communities throughout Alberta to celebrate coal mining as part of the province’s proud industrial tradition. As a result, you can explore an extensive network of historical coal mining resources that includes the giant colliery of the Atlas Mine, the Galt No 8 tipple silhouetted on the rim of the Oldman valley, and deep into the Bellevue Mine Underground Tour where black is truly black. The traveller can create a fascinating “on the road” expedition itinerary or a simple series of week-end excursions or day trips through the full range of Alberta landscapes, historical experiences, and recreational treks. Either way, the mining history of Alberta and BC offers unparalleled adventure through unrivalled scenery. Alberta Online Encyclopedia – albertasource.ca. Ian Clarke is an Alberta Government historian and the Regional Director, Southern Operations, for the Historic Sites and Museums Branch. He was trained in Canadian History at the University of Calgary and the University of Manitoba. Ian has worked in Historic Sites research, planning and development for the past thirty-two years, first with Parks Canada and then in the Alberta Historic Sites system. Special thanks to Alberta Energy and to Johnnie Bachusky and the contributors to the ghosttowns.com.